"The inner peace that comes with the quiet contemplation of a beach on a still calm morning, or the feeling of exhilaration that comes from riding a great wave in a small boat, is more reward than most will ever know." This we have in common! If anyone knows where I can get a copy of Canoe's "The Art of Wave Riding" - drop me a line - Thanks SHF, and keep up the good work. Ron Drummond was my great uncle and I have a copy of this photo and his book. He was such an amazing man!! Ron Drummond was my great uncle also I was named after him, I got a chance to ride with once it was awesome. He was amazing!! Thank you for that great story...I'm Doris Walker's son, Brent. Ron was such a great friend of ours. We went out with him in his canoe (along with his 125 lb. lab Surfer) going down San Juan Creek to the ocean once, and also went out with him to watch them build the Dana Point jetties. 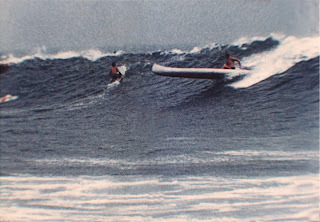 It was always such a kick when I was 5 or 6 years old to see him canoe surf with his huge lab Surfer along for the ride. Excuse me, my error...Surfer was a Newfoundland Dog, not a Lab!